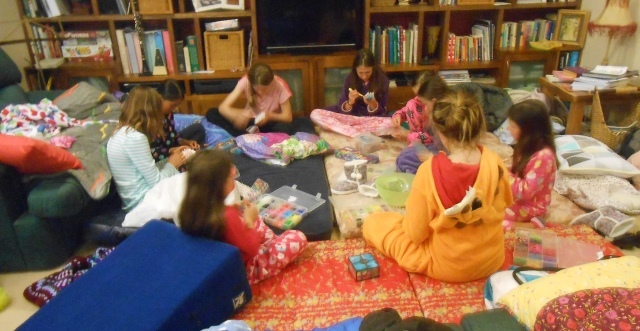 Our living room was invaded by 9 girls this week for a sleepover with kids from Kids’ Vegies on the Verge. It was noisy, chaotic and fun. It was also all about building community. The girls, ranging in age from 7 to 13, go to five different schools and most of them didn’t know each other 12 months ago. A few of them were friends before meeting through the garden but, despite living within a few hundred metres of each other, they generally didn’t know each other until Cathy, Jasmine and Alexa started the garden. Through the garden they have become good friends and were very excited by the thought of a mega-sleepover. Some of them arrived in the early afternoon and all of them had arrived by dinner, and for most of the following day we had four or five girls happily playing at our house. What a great way to spend school holidays! These types of activities are really beneficial for the kids. The age range encourages them to look after each other and to make allowances for the younger one. Rather than just knowing kids from their own school, they get to mix with other kids and make friends outside of school. I’ve read about the days when the Catholic and State school kids didn’t mix – it certainly isn’t the experience in our street since the garden. I’m sure that the garden and these types of events are significant protectors in terms of child protection. If something happens to any of the kids they now have increased social capital and there are more adults they can turn to in a the time of a crisis. In doing things like the garden and the sleepover, one of our motivations is to demonstrate alternatives to technologically based entertainment such as TV, iPods and a Wii. The girls had a great time and there was no screen time. They worked on their Rainbow Looms (which is more plastic than ideal), built human pyramids and played various games. They even got some sleep! This entry was posted in Working with communities and tagged Children, Community gardens, Girls, Kids Vegies on the Verge, Parenting, Sleepover, Social capital. Bookmark the permalink.